The chin crease (also known at the mental crease) develops over time as a result of repeated contraction of the mentalis muscle. It is generally more prominent in men than women as men have a stronger chin muscle. The chin crease can be treated using dermal filler and anti-wrinkle injections and can give results lasting up to 12 months. We can easily reduce the chin crease (also known as the mental crease) using a combination of dermal filler and anti-wrinkle injections. Dermal fillers are a gelatinous product which is injected under the skin to lift the skin up and reduce the appearance of the chin crease. Anti-wrinkle injections relax the chin muscle (the one responsible for pulling the chin up) and thereby reduce the depth of the chin crease over time. 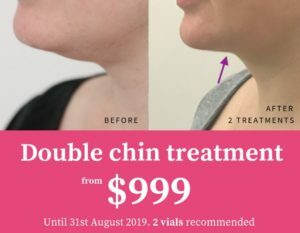 How much does chin crease treatment cost? Have a read of our cost page for a guide to dermal filler cost in the chin crease. You are likely to use 1ml of filler to soften the chin crease. We would also use approximately 2 – 4 units of anti-wrinkle injections at a cost of $24 – $48 to the chin muscle (mentalis muscle) to relax this at the same time. What are the risks of treating the chin crease with dermal filler? 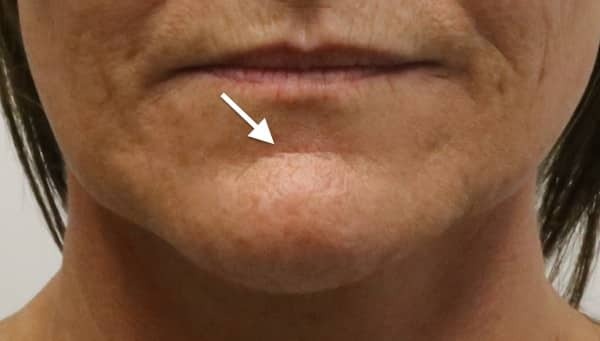 The chin crease is one of the safer areas to treat with dermal filler as it is less vascular than other areas of the face. There is a small chance of a bruise after treatment with dermal fillers. Your practitioner will discuss the risks and benefits of treatment on the day to ensure that you are fully comfortable before proceeding. How do I book an appointment for chin crease treatment? 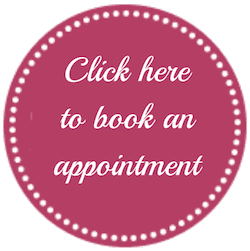 Click on the book an appointment button below and select ‘dermal filler’ as your appointment type.